Many of Duluth’s streets were platted between 1890 and 1910, most often by real estate developers who chose to name the streets after themselves or family members, and so the vast majority of the Zenith City’s roadways are labeled in honor of fairly wealthy white men. There are, of course, exceptions, such as “invisible investor” Lillian Mosher, who named Lillian Avenue in Piedmont for herself. Anna L. Zimmerly was another. 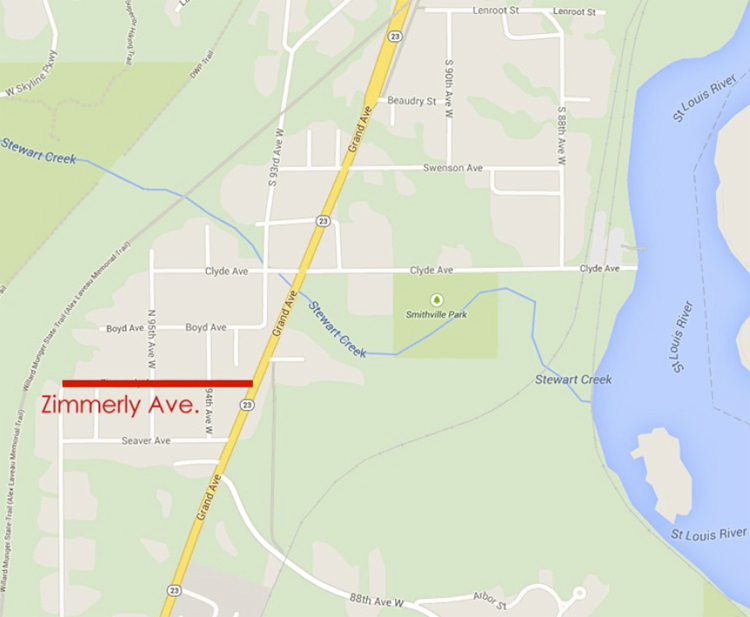 Zimmerly owned significant property in Smithville, and today Zimmerly Avenue bears her name. Both Mosher and Zimmerly were unmarried daughters in families with no sons, and both had sisters who married into real estate investment families—sisters with whom they stayed close all their lives. Anna L. Zimmerly was born in 1844 in Erie, Pennsylvania to John Jacob Zimmerly and Mary Olmsted Cook Zimmerly. She had four sisters, one of whom died as a child. She graduated from the Albany State Normal College in 1859 and taught school in Erie for two years, after which she moved back to her childhood home to care for her ailing parents. She remained there until she was forty years old, while her three sisters married and moved on. The youngest, Frances E. Zimmerly (called Fannie), married a local doctor, Arthur S. Lovett. After her parents died, Anna Zimmerly inherited the farm and property, amounting to $7,120 in 1884. (Approximately $182,000 in today’s terms.) Soon thereafter, she joined Fannie and her husband in Minneapolis. For the rest of her life, her financial fate was tied to the Lovett brothers and Duluth’s real estate booms and busts. Meanwhile, his brother Charles had set his sights on Duluth, Minnesota—particularly on the riches that could be made from West Duluth real estate. In a speech he gave many years later, he recounted his first visit to the Zenith City on December 9, 1885, describing how West Duluth was merely slash-cut land, and Grand Avenue was a corduroy road through tall bushes. 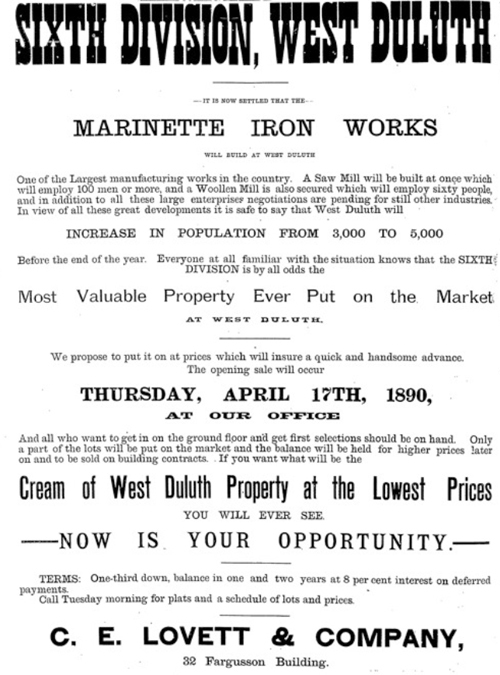 He moved to Duluth on December 2, 1886, and eventually went on to be West Duluth’s biggest booster, owning thousands of acres there and in New Duluth, Smithville and Fond du Lac, as well as properties elsewhere in St. Louis County. Along with him, at least financially, came his brother Arthur, who moved to Minneapolis and invested in a Twin Cities shoe factory and the St. Louis Bay Company. When Anna Zimmerly moved to Minneapolis, she invested in Duluth properties as well. By 9 o’clock there is a dense mass of hustling, howling, real estate flesh and bones outside the door, which is soon thrown open and then the fun begins. It was the intention of the managers of the sale to admit only five persons at a time but intention counted for little with the crowd who swarmed into the office, smashing the glass in the door and several railings near desks. C. T. Abbott was quite badly cut on the hand in his desperate struggle for wealth and others were bruised. Sales at the end of the day amounted to $142,000—over $3.6 million today—and every lot on Central Avenue in the Sixth Division was sold. Why, it will not be fifteen years before West Duluth will be as near the center of population as Third Avenue West is now. Then Duluth, with its three or four hundred thousand people will extend from Lakewood, beyond Lester River to beyond Fond-du-Lac. Don’t smile incredulously at this prediction, for it will come true. The family’s adventure in Juneau didn’t last long, however. By 1902, they’d mostly returned to Seattle, and the same year, Zimmerly sued to recover investments she’d made with the Windham Bay Gold Mining Company, accusing the principal of swindle. She recovered her initial investment, but failed to recover what she claimed was her due: $12,000. The Lovetts and Anna Zimmerly spent their middle age investing in the Seattle fishing industry and the scenic railway, and eventually moved as a family to West Palm Beach, Florida, where Fannie died in 1917; Anna passed seven years later. Dr. Lovett continued to invest until well into his seventies, and lived on in West Palm Beach until his death at age 102. They all are buried in Erie, Pennsylvania, in the Zimmerly family plot.